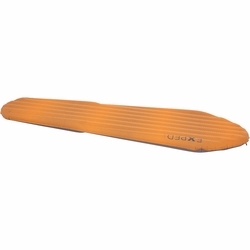 Exped SynMat HL Sleeping Pad. The SynMat HL is the world's lightest mat at its warmth and comfort levels! It packs to an extremely small size and it's tapered profile fits into the smallest tents. Tapered design and 20 denier fabric for weight reduction, microfiber insulation for 3-season warmth and 7cm thickness for comfort. This mat proves that comfort and warmth need not be sacrifice in pursuit of super light packing. Ingenious tapered shape allows 2 mats to be placed next to each other in the smallest of tents placed head to foot. The dual purpose flat valve with one-way flap ensures swift inflation with the Mini Pump. Insert the attached pin into the valve for simple deflation. The valve is durable and protected from damage due to the flat design.